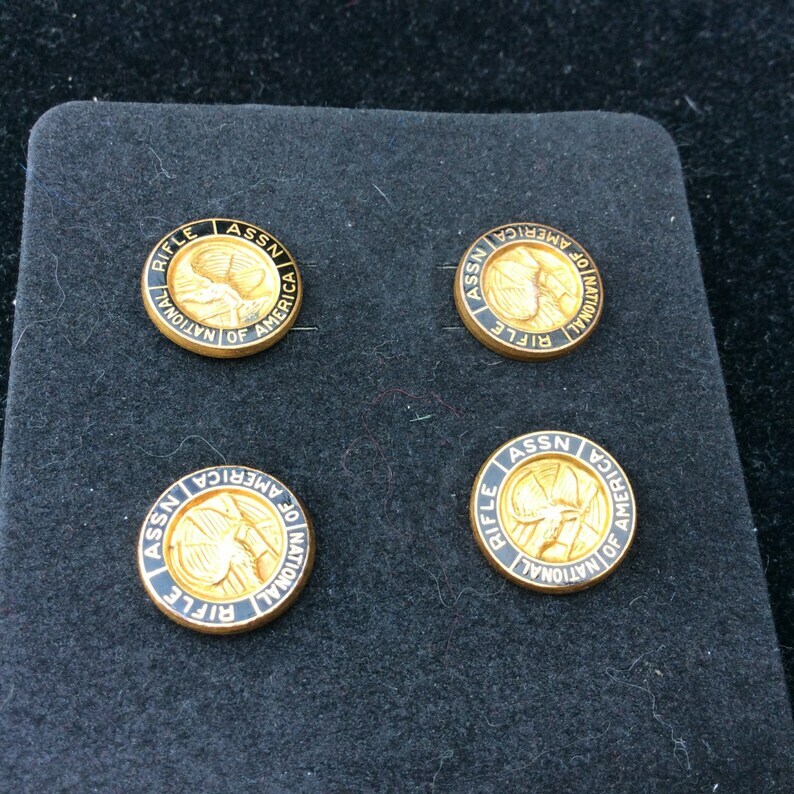 Collection of four, NRA membership pins, from the 1970s to the 1980s. The listing is for all four of the pins together. They all have variations of the same hallmark shown in the detail photo. 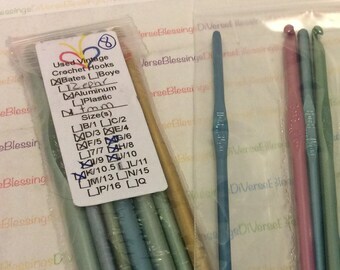 Very useful for a lace knitter. 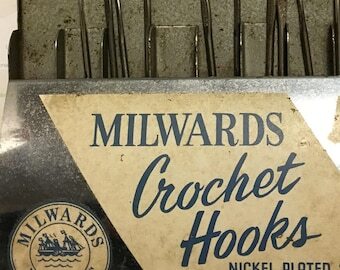 Very useful for a lace or sock knitter. Excellent, speedy service and product was exactly as described. 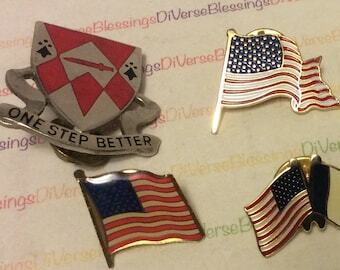 I will definitely do business with DiVintageBlessings again! I accept PayPal and Etsy direct. Sales tax is added to all orders placed in New York State. Coupon codes must be submitted at checkout. There are no after sale adjustments. Questions? Please use the Etsy Convo system. I do not respond to outside emails. This shop carries mostly used and/or vintage items. Any flaws or defects are clearly described in the listing. Please examine photos carefully. I take extreme care in packaging and shipping to ensure your purchase arrives in the condition you expect. All sales are final. I am no longer accepting returns after receiving items that were destroyed before being returned to me. This is the really yucky part. I try to do a really good job so you won't have any problems with your purchase. If something goes wrong, please give me a chance to address it. Buyer has 7 days after the receipt of the purchase to request a cancellation. I always use tracking so there is a record of receipt. Purchase must be returned to me within 7 days of my agreement to accept the return. Unauthorized returns will not be accepted. Items received beyond 7 days are subject to a restocking fee of 1% per day. Example: 1 day late = 1%, 9 days late = 9%. I strongly recommend you use tracking. My refund policy is based upon the Golden Rule. It is what I as a buyer would consider fair. 1. The seller (that's me) made an error, sent the wrong item, forgot part of the order, etc then the seller makes it right with no additional cost to the buyer. Seller will replace wrong item, buyer keeps all merchandise, no returns required. 3. Postal problems. Tracking number is ALWAYS provided. The postal service in the USA has never lost a package since I've opened my shops. A few orders have taken weeks longer than they should have but all have eventually arrived. Come on, admit it, you know that sellers can't control the workings of the postal service. Have patience. Etsy is a marketplace, not a manufacturer. There are some large companies who use Etsy, but I'm not one of them. Again, for the record, this is a one woman shop. I simply cannot afford to offer unlimited free returns. Questions about shipping? You can add items to your cart to see what the shipping fees are, without making a commitment to buy. You can always remove items before you complete the transaction. Most of the listings in this shop use Etsy's calculated shipping which automatically combines the weight and dimensions of everything in your cart. Shipping upgrades are available at checkout. A few of the more expensive items are set to Priority Mail. This applies to domestic shipping only. International orders will ship first class with insurance. All orders ship with tracking. Please place your order at least 10 calendar days prior to the date you want to receive delivery. What is the difference between NOS (new old stock) and OP (original package)? •NOS indicates items that are unused, in the original package. I use this term only on items that are either in original sealed packages or that were sold to me as New Old Stock. •OP these items *may* be NOS but I can't be certain. 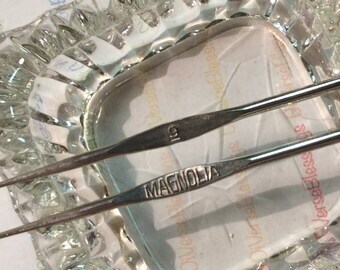 They are in the original packages but may have been used. These are often items in vinyl storage cases or on cardboard hanging tags. •Many items such as double pointed needles have no markings on them. Items in the original packages provide information about the age and origin. •Packaging is instrumental in helping me identify and correctly attribute the numerous used items that have no markings. There are subtle differences in shape, color and finish between different brands. •Most makers have a preferred brand, based on these differences, and I want my customers to find that hook, needle or notion that they can't find any where else. With the exception of Nancy's Knit Knacks, I do not have a wholesaler. Most of the items in this shop are from yard sales, thrift shops and online "picking." In most cases, I truly only have one of each item listed. If you don't see what you're looking for, check back in a few months. I try to offer a broad selection to enable my customers to find that item they've been searching for. This is a one woman shop, featuring used and vintage merchandise. My business practices are an expression of my faith and I try to do right by everyone. That being said, I am neither a door mat, nor a punching bag. If you have a problem, please give me the opportunity to fix it first, before leaving neutral or negative feedback. I'm also mad as a hatter, no joke. So please don't poke the crazy lady.